Mike Sladden is the director and co-owner of Camp Pathfinder, a century-old boys’ canoe trip camp in world-famous Algonquin Park, Ontario. A third generation Pathfinder camper and guide since 1969, he now lives for six months each year at camp’s rustic island base in the Algonquin interior, where he leads Pathfinder’s wilderness tripping, scholastic outdoor education, and in-camp programs. “Sladds” and his wife Leslie have raised two sons at camp and in their hometown of Rochester, New York. Mike received bachelor degrees in History and English Literature from Connecticut College, where his interest in photographic history led him to graduate work at SUNY’s Visual Studies Workshop in Rochester. He joined the curatorial staff of the International Museum of Photography and Film/George Eastman House in 1986, becoming curator of education in 1989. Over the next decade he directed the museum’s school-aged and lay audience education programs, and worked as both a team member and manager on numerous exhibitions and public programs interpreting the history, art and technology of photography. As Pathfinder’s director, Sladds has overseen a comprehensive preservation of this historic camp as a low-technology, small-footprint community. He has also led the camp through a long-term refinement of its staff and wilderness guide training, CIT leaders program and Pathfinder canoeing curriculum. 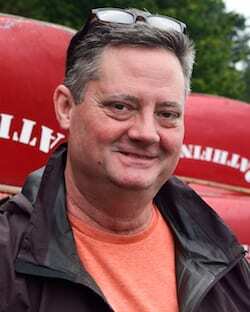 His certifications include Wilderness First Responder (WMA), Level II Instructor in Ropes Course leadership (CUI/ACCT), and ORCKA Canoeing Moving Water. He is a member of the Ontario Camps Association. In 2012, he was elected to the Canadian Society of Camp Directors.